The shift from the Agricultural Age to the Industrial Age only a few hundred years ago was accompanied by the rise of modern cities. However, one thing that did not shift so much was humans' desire to live in tribes, to live with people from their own heritage, who spoke their own language. The city of Boyle Heights in East Los Angeles suffered extensive growing pains as Latinos, Jews, African-Americans and Asians had to learn to live together since its founding as one of LA's first neighborhoods. The new film "East LA Interchange," that I saw at the New Urbanism Film Festival last week where it won the Best Feature Film Award, explores how the freeways - a symbol of Los Angeles ingrained in America's consciousness - impacted the melding of Boyle Heights' distinct tribes. The freeway systems changed the face of the U.S. and no community was impacted more than Boyle Heights with five major freeways dissecting the neighborhood, including the behemoth "East L.A. Interchange." Filmmaker Betsy Kalin interviews current and former Boyle Heights residents including,will.i.am, Father Greg Boyle of Homeboy Industries, and Josefina López of Casa 0101 while actor Danny Trejo narrates. "East LA Interchange" tells the story of how this one neighborhood found its political voice in its fight against the freeways. It documents the evolution of Boyle Heights as city planners and highway officials made unilateral decisions - that affected the city greatly - with no input from its residents. Over time, this created an atmosphere of political activism where the residents came together to have a say in what was being done to their city in the name of "progress." The film provides a compelling look at what the future of America can be if the people in communities such as Boyle Heights can learn how to work together to secure our nation's pledge of providing justice for all. Through her film, Betsy Kalin uses Boyle Heights to represent countless towns throughout America. Her documentary humanizes the story of people across our country who are affected by discriminatory public policies, industrial/commercial development and gentrification. It is an important story that will resonate with everyone who is facing similar issues and it will also give hope that they too can fight to better their communities. 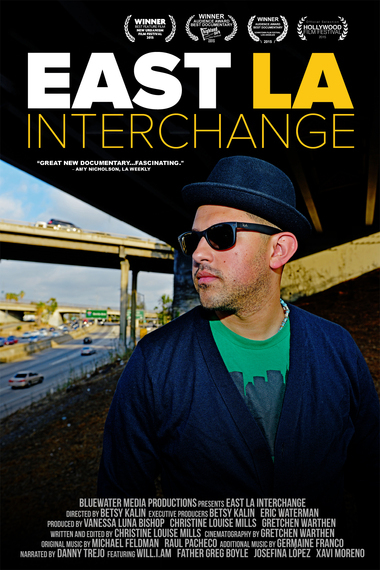 Not just a story about one neighborhood, "East LA Interchange" is a funny, insightful and poignant documentary that will transform how you think about living in the United States today. You can find out how to watch the film at BlueWaterMedia.org.